"Annabelle puts her hand in the water and scoops out one of the goldfish she got at the county fair." The stories in this collection have appeared in journals ranging from Narrative Magazine to The Fairy Tale Review, and include the much loved "Ever After," which was featured on NPR's "Selected Shorts." This was a very special book of stories which connected with me on many levels. The Palace of Illusions is the perfect title for this grouping, or maybe the Author picked the perfect group of stories for the title. Whichever is true, everything fit perfectly. I've read many short story collections that had me stopping halfway through or maybe picking up one story and leaving the rest for another time. I felt The Palace of Illusions had a larger story to tell once you put everything all together. I love THOSE kinds of short story books the best. Maybe because I'm not the "short-story" kind of gal and I love myself a great big honkin' novel... but whatever the case, I fell in love with over half these stories. I thought the Author started off very strong and stayed that way for the first half of the collection. I wonder if it feels that way to me because she grouped them so that the first few might have been more my "type". Anyways, I would say that my favorite stories were: Beautiful Lady of the Snow, Breath, Night Owls, The Other Woman and In the Time of the Byzantine Empire. I took some notes on a few of the front runners before I started to see the connection. Without giving much away, I'll give a rundown of a few of the stories. The first story, "Beautiful Lady of the Snow", is told in the eyes of an innocent, it tells of the corruption surrounding her that starts to envelop her. The story is tragic yet at the same time you start to really understand how easy innocence can rot and can start to crumble apart. I won't say anymore, but this might have been my favorite story of the collection. "Breath" is about a woman attending a yoga session, and this was something I can totally relate to. So, you know how the yoga/meditation instructor tells you to release your thoughts and give your mind a blank slate... yeah? Does this ever work for anyone? Not for me and apparently, not for the main character in this story. I loved that, I loved the relatability and comradeship that this gave me, I AM NOT ALONE! Pretty spectacular is all I'm saying. Lastly, "Night Owls" is a cool take on the inner thoughts of a love triangle, with the 'grass is always greener' moral to ponder over. Taking all of these stories together (the whole collection) you begin to see a pattern and theme emerge. I love it when that happens, the "OH, I got it!" moment. The narrators of many of these stories aren't great people, they've done things most people would look down upon (if spoken aloud). These 'sins' throughout the stories connect so that we get to see those inner thoughts and relate to the mishaps (maybe we've done something similar but wouldn't like to admit it). The beauty of it lies within the looking glass, we get a different perspective, which ultimately unveils the illusion that surrounds these 'sins' or 'wrong deeds'. People are not perfect, you are not perfect, I'm not perfect... we all make mistakes. 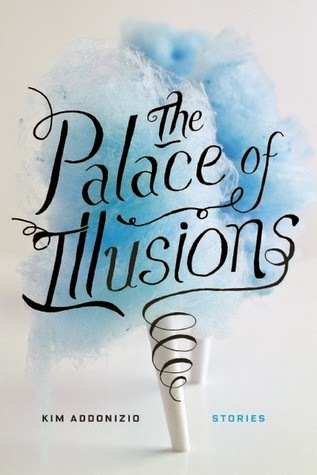 The title of this collection The Palace of Illusions is exactly that, a giant palace that houses many types of people (not perfect, very flawed and normal) and each person is very sweet on the outside (what you see) but then the layers pull away as the story unravels and you see the real stuff behind the illusion, the sour stuff within EVERYONE. You may call this bleak, sad, troublesome, etc... but I see it as real, she is giving us the real human condition served on a giant platter of candy. Enjoy!